3 Cool Tools to Help You Save Money This Holiday Season! This is a guest post from Ann Smarty from Buxr. Thanks Ann! BeatMyPrice is a fun online tool that claims to beat any price you provide: just specify the item name, deal URL and price and let the service beat your price. 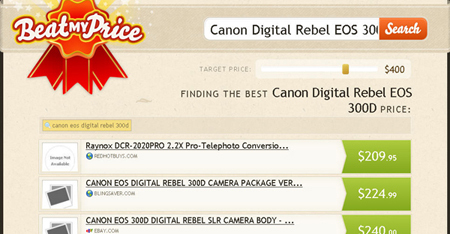 The huge list of prices aggregated from numerous sources for you to compare! Buxr is a community of bargain hunters who share latest deals and coupons in numerous categories. User-submitted deals are rated by other members, the best deal wins $10 daily (join and earn too!). PriceAdvance is a FireFox and Internet Explorer addon that looks for the lowest price offered by Amazon.com, BestBuy or WalMart. 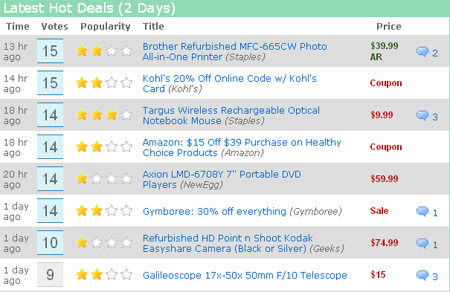 It instantly alert you to current deals once you visit the seller ’s website. While you shop for products at your favorite merchants, PriceAdvance will automatically search other retailers for better prices. 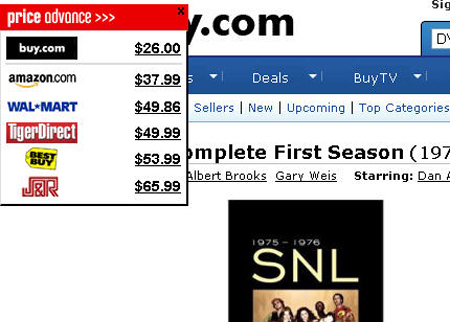 When prices are found a small overlay window will appear in the top left of your browser window. To view a product in the overlay, click the price or company logo. Easy and fast price comparison. Previous post: Dr. Seuss Board Games $5 Shipped!